Twenty years ago today, Crown Prince Pavlos of Greece married British-born heiress Marie-Chantal Miller in a Greek Orthodox ceremony at St. Sophia's Cathedral in London. Two decades and five children later, the pair are still happily married. 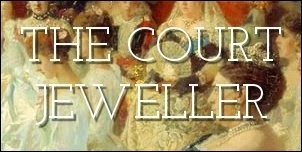 Let's have a look at the jewels worn on their wedding day -- especially those donned by the bride. Marie-Chantal's diamond and pearl bridal tiara was a loaner from her new mother-in-law, Queen Anne-Marie of Greece. The tiara, which is known as the Antique Corsage Tiara, was Anne-Marie's eighteenth birthday gift from her parents, King Frederik IX and Queen Ingrid of Denmark. As you may have guessed from its name, the tiara was made by repurposing a corsage ornament (or stomacher) that belonged to Queen Victoria of Sweden, who was Queen Ingrid's grandmother. The tiara was also later worn as a wedding tiara by Tatiana Blatnik, who married Pavlos's brother, Prince Nikolaos. Marie-Chantal also wore small diamond earrings with her wedding ensemble. The new princess paired her wedding jewelry with a gown by Valentino. For whatever reason, there are very few photographs of the wedding guests available for me to include here. But we do have a good snap of three of the most important royal ladies at the wedding: Queen Elizabeth II of the United Kingdom, Grand Duchess Josephine-Charlotte of Luxembourg, and Queen Silvia of Sweden. All wore pearls; Queen Silvia appears to be wearing the two-stranded pearl necklace that belonged to Princess Sibylla, while Queen Elizabeth is wearing the Kensington Bow Brooch that belonged to Queen Mary.